ROANOKE (WSLS 10) - WSLS 10 is partnering with the United Way of Roanoke Valley for a telethon aimed at raising money to help hundreds of homeless children. There are more than 500 homeless children in Roanoke City schools and more than 200 families who do not have a home. About 80 percent are not eligible for government support because they aren't living on the streets. "A kid who is in crisis is not a kid that's going to learn. The only thing they're going to learn is how to survive," said United Way Roanoke Valley president and CEO Afira Devries. "Participating in RYSE is giving a child an opportunity to look beyond the scope of the challenge they're dealing with, and think about their future. This is life-changing work." Here is what different donation amounts can do. "This telethon is an opportunity for the community to come together around an issue that is pressing, that is on the minds of teachers, parents, it's an important issue," continued Devries. "This telethon gives this community an opportunity to do something about it." 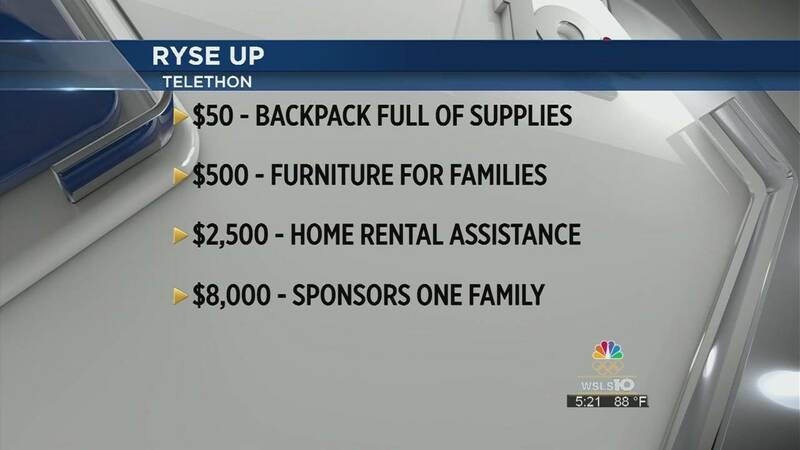 You can donate now by clicking here, or you can watch WSLS 10 on Wednesday, June 29 from 5 a.m. to 8 p.m.
We will have a phone bank along with a live 30-minute special starting at 7:30 p.m.